Pvt. 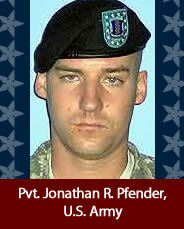 Jonathan R. Pfender, U.S. Army, age 22, of Evansville, Ind. ; assigned to the 1st Battalion, 187th Infantry Regiment, 3rd Brigade Combat Team, 101st Airborne Division, Fort Campbell, Ky.; killed Dec. 30, 2005, when an improvised explosive device detonated near his Humvee during patrol operations in Bayji, Iraq.